Getting a pay raise while sitting on the couch? Sign me up! Thanks Realty Income for another pay raise! It's hard to argue with 4 dividend increases in less than a year and that's exactly what Realty Income (O) has done. On September 8th the Board of Directors at Realty Income announced an increase to their monthly payout boosting it to $0.202 from $0.2015. That's a 0.25% boost. Realty Income is a Dividend Contender with 23 consecutive years of dividend increases. Shares currently 3.77%. Check out my recent analysis of Realty Income over at Seeking Alpha and find out if I think it's a buy, sell or hold. 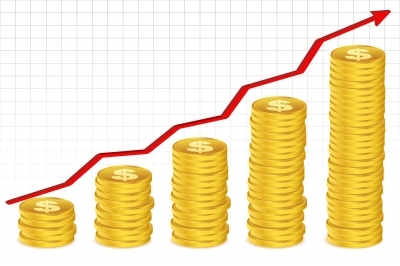 Realty Income routinely gives investors multiple raises throughout the year, rather than just one larger increase. Looking into that 23 year streak there's 553 consecutive monthly dividend payments, 88 increases and 75 consecutive quarterly increases. So the year over year comparison is a better metric for dividend growth. Compared to October 2015's payment the dividend has increased 6.04%. Since I own 91.685 shares of Realty Income in my FI Portfolio this raise increased my forward 12-month dividends by $0.55. This is the 16th dividend increase I've received from Realty Income since initiating a position in mid 2013. Cumulatively my income from Realty Income has increased by 11.3%!!! According to USInflationCalculator the total rate of inflation over the same time period is just 3.3% so Realty Income has increased my income over 3 times faster than inflation has eaten away at it. 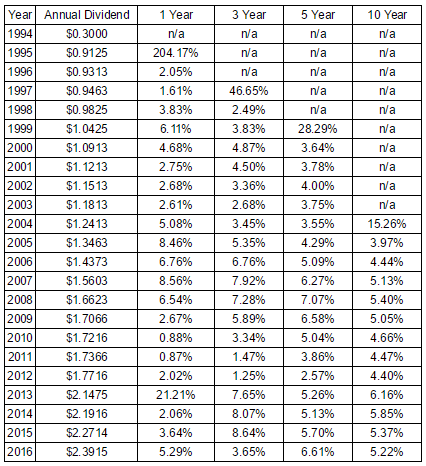 That dividend history is a thing of beauty although the approach can best be described as slowly, but surely. Those dividend growth rates work out well when shares are offering a starting yield of 5%+; however, over the last year Realty Income has been one of the top performers in the entire market. Unfortunately a rising share price means a declining yield which is currently at 3.77%. My forward dividends increased by $0.55 with me doing nothing. That's right, absolutely nothing to contribute to their operations. Based on my portfolio's current yield of 3.03% this raise is like I invested an extra $18 in capital. Except that I didn't! One of the companies I own just decided to send more cash my way. For a dividend growth investor there's not much that's better than hearing news of a dividend increase. So far this year I've received 37 increases from 29 companies increasing my forward 12-month dividends by $205.52. My FI Portfolio's forward-12 month dividends increased to $5,467.61 and including my Loyal3 portfolio's forward dividends of $65.06 brings my total taxable account forward dividends to $5,532.67. Do you own shares of Realty Income? Are you loving these dividend increases as much as I am? This is what every DGI wants. An ever increasing dividend payment. Most definitely. Realty Income might not give out 10%+ raises, but 4-6% every year is just fine with me.